In a bowl, whisk together egg, egg whites, quark, garlic powder, salt, and pepper until well combined. Spray a frying pan with cooking spray or lightly coat with olive oil, and heat on medium heat until splashing a sprinkle of water on it causes the cooking spray/oil to sizzle. Pour the egg mixture into the pan, let it sit for about 30 seconds, and then start making some scrambled eggs by swirling the egg around with a spatula. Once the scrambled eggs "harden" and are close to being done (aka slightly moist), toss in spinach and mix together. Sprinkle on a little more garlic powder, salt, or pepper if you so wish. Continue heating and mixing until spinach is wilted. Remove spinach and egg scramble from heat. On the bagel thin/bread of your choosing, lay down a few large leaves of spinach - this served as a barrier for the bagel hole so I didn't have draining eggs. The fresh, unwilted spinach also adds a nice, soft crunch to the sandwich. 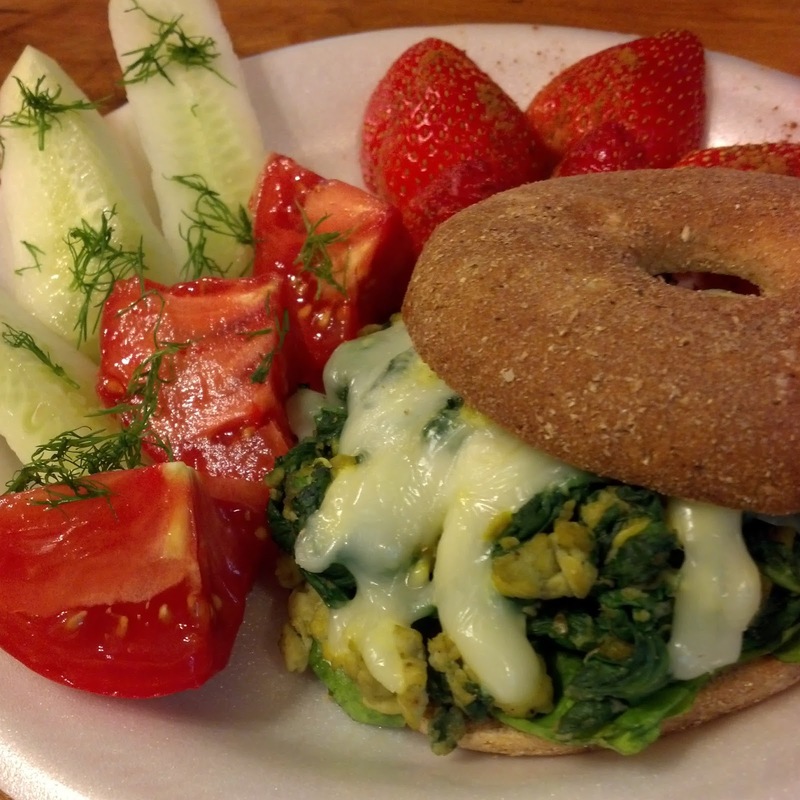 Evenly place the scrambled eggs on top of the fresh spinach leaves, and sprinkle on the good-'ol-cheese, shredded. Place both the egg-topped bagel half and the lonely, untopped bagel half into a toaster over, separately. Bake (not toast!) until the cheese is melted. Put the sandwich together and pair with some fresh tomato and cucumber slices (I topped mine with dill...mmmm).